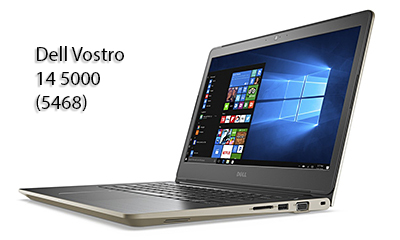 Tech I use: Dell Vostro 14 5000 (5468) business notebook review « Tech bytes for tea? It’s targeted at small-business owners and professionals like myself and I’ve been most satisfied with the notebook from day 1. The Vostro 14 5000 is powered by an Intel Core i7-7500 CPU at 2.90GHz, with 8GB RAM – this is more than adequate for all the work tasks that I use the notebook for, and even with multiple applications and browser tabs on, the machine doesn’t turn sluggish. On the left side of the Dell Vostro 14 5000 (5468) business notebook is a DC power input port, an RJ45 Ethernet port, a HDMI port, 2x USB 3.0 ports (1 more on the other side), and a headphone port. A very well connected laptop. In terms of connectivity, the 14 5000 comes with three USB 3.0 ports, an RJ45 Ethernet port, an HDMI port, a VGA port and an SD card slot. There’s also a DC power input port, a headphone port and a Kensington lock slot. USB connectivity is something I value in my business laptop. With three on the Vostro, I can connect an extension desktop harddisk, a USB thumbdrive and a mouse – simultaneously. Many notebooks are stingy with USB ports, in the quest for slimness and portability – the worst are those that ships with a mini-USB port that requires and extra adaptor to plug inregular-sized USB connectors. The same goes for the regular-sized HDMI port. I connect a second larger monitor when I work at home and cables with the regular-sized HDMI connectors are much more ubiquitous than those with mini-HDMI connectors. It’s also important for me that the Vostro has a traditional VGA port – most projectors out there still require a VGA port so it’s real convenient and important for the notebook to have VGA connectivity. The keyboard of the Dell Vostro 14 5000 (5468) business notebook is a pleasure to use, with its large, well-space keys, with a good amount of travel. The trackpad is also responsive when a mouse is not connected. The keyboard has large keys with good spacing in between, and a good amount of travel. The trackpad is responsive and usable when I don’t have a mouse connected. The 14 5000 comes with a 14-inch display with 1366 x 768 resolution. This is not top of the line in terms of resolution, but it is more than enough for my work. On the move, the display is big enough for me to tile two windows side by side. At home, I connect a second monitor to extend the screen real-estate. The 1 TB of 5400 RPM SATA hard drive is more than enough for me – I haven’t even gone near running out of space yet. For photo and video editing, the integrated Intel HD Graphics 620 is complemented by an NVIDIA GeForce 940MX GPU and is definitely good enough to drive the display. Despite the powerful performance, the Vostro weighs only 1.59kg – light enough for me to carry around between meetings and event venues without giving me a backache. Battery wise, it’s one of the more long-lasting laptops I’ve used, with an advertised life of 10 hours. I tend to hit 8-9 hours before having to look for an outlet. This entry was posted on Friday, July 28th, 2017 at 8:00 pm and is filed under Business IT, Dell, Gadgets, gadgets, Notebooks, notebooks, Opinion, Prices, Review, reviews, Specifications, Windows 10. You can follow any responses to this entry through the RSS 2.0 feed. You can leave a response, or trackback from your own site.